31. What is a bucket field in reports? Ans: This field is used for custom grouping of values in a field. This can be used in summarising the report. 32. What are dynamic dashboards ? 33. Can the dynamic dashboards be scheduled? Ans: No they cannot be scheduled. 34.How can you use custom label; in visualforc page? 35.What are the types of custom settings in salesforce? 36.What are the different types of collections in apex? 37. What are maps in apex? Ans: Map has keys and values. A key points to a single value. Map can be used to store realationship between two entities. Keys in map are unique. Values can be duplicated. 38. 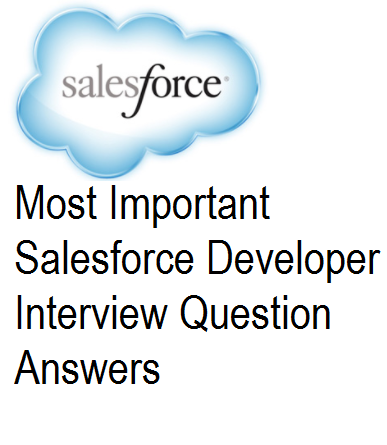 What are the different types of object relations in salesforce ? 39.Can you have roll up summary fields in case of parent child relationship? Ans: No. These are present only in case of master details relationship. 40. Can you see a lead which is converted in saleforce UI? Ans: The detail record is not seen. But a page, wherein it shows the links for formed account, contact and opportunity. 41. What is the difference between action function and action support ? Ans: Action functions can call controller method from java script, action support adds support to other components. 42. What is action poller in visualforce ? Ans: Action poller sends AJAX request with a specified time interval. 43. What are the different types of reports available in salesforce? 44. How many active assignments rule can you have in lead/Case? 45. How do we access static resource in visualforce?